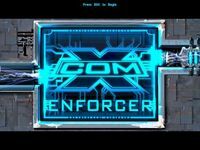 X-COM: Enforcer is a computer game created by Infogrames. It is the fifth game in the X-COM series, but takes place in a time line separate to that established by the first four games of the series. This game was presented as a third-person shoot'em up game instead of tactical turn-based strategy as in previous games. Source: Wikipedia, X-COM: Enforcer , available under the CC-BY-SA License.